It seems that every sport has its own code of etiquette that even the newcomers are supposed to know from day one. Swimming is among those sports, though the "rules" are pretty easy to pick up. If you're looking to start swimming for fitness, or if you're training for your first triathlon or open water swim, it's likely you will go to a public pool for a workout, and you won't be the only one there. A pool full of lap swimmers going at a steady pace is a beautiful thing, but it can be intimidating if you're interested in jumping in and joining. If there's an empty lane for you, that's easy. But that's not always the case, and if enough swimmers show up, you may need to learn how to share your lane anyway. Here are some common lap swimming rules that are good to know for the next time you head to the pool for a workout. Though you may occasionally find an empty lane that's all your own, oftentimes you will show up at the pool for your swim and see that each lane has one or more swimmers already going. This doesn't mean you're out of luck. A single lane can accommodate several swimmers (just go watch a swim team practice) provided they all go at a comparable pace. Take a minute to observe each of the lanes and get a sense of which one you match up with best. Some pools designate slow lanes and fast lanes, but seeing the swimmers that are already going is an even better gauge. If you're ready to pick a lane and start swimming, make sure everyone in that lane is aware that you're going to join them. Sit by the edge of the pool and wait for them to finish a set, or wave a kickboard underwater to get their attention, or jump in and stand in the corner of the lane until they acknowledge you're joining them. At that point, it's worth it to have a quick discussion about how you're going to swim in concert—either by splitting the lane (if there are just two of you) or by swimming in circles (if there are two or more). 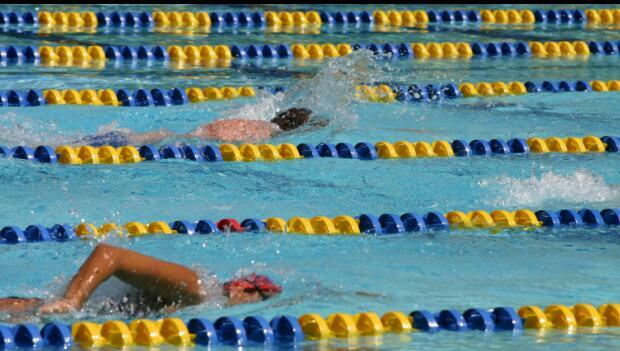 Splitting the Lane: In this scenario, one of you swims on one side of the lane and one of you swims on the other. If you're splitting the lane, you stay in your half no matter what. Circle Swim: Much like traffic on a road, always swim on the right side of the lane. This means swimming on one side of the lane going down and the other side of the lane coming back. Swimmers move in a counterclockwise circle, hence the name. Some pools require splitting lanes if there are just two and going to a circle if there are more than two. Other pools require circling lanes even if you're by yourself. Whatever the case, make sure everyone in your lane is on the same page before you get started.